I think it’s just my fate to always have a small bathroom. 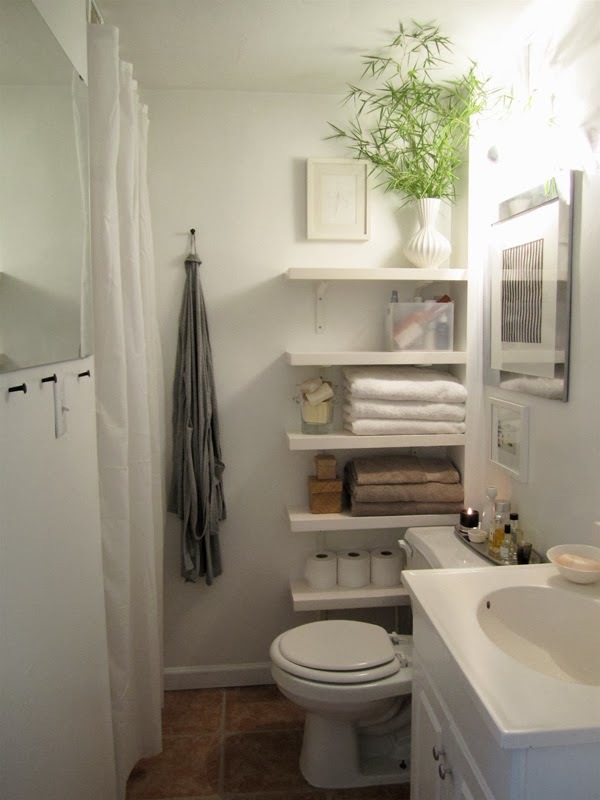 Even the master bathroom in our home is small, even for a regular bathroom…. 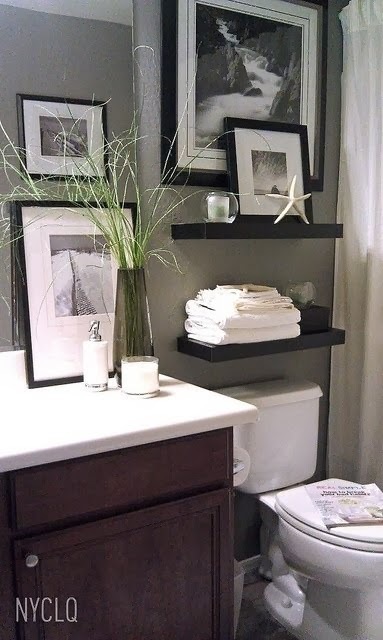 We make do though, and the best solution I’ve found is to use vertical space to create storage options. We have a cabinet installed over the toilet, and the towel rods are installed on the back of the door. Here is some more inspiration for fellow endurers of small bathrooms. You can find cubbies and shelves in all sizes nowadays, and don’t overlook even the narrowest sliver of wall as a possibility for storage. 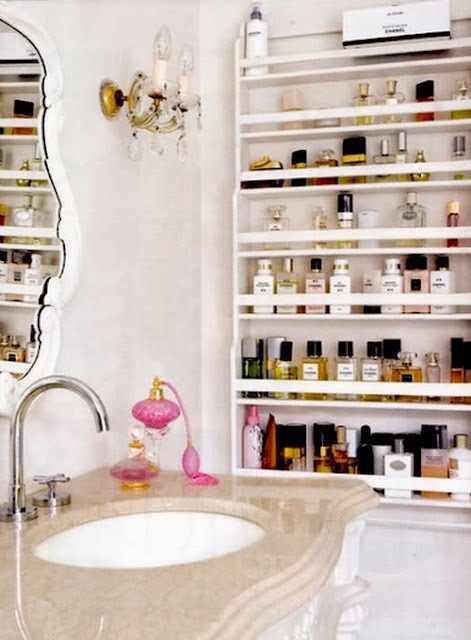 If you can maintain a clean organized look with your items out in the open, open shelves will be fine. If not, look for cabinets with sliding doors or drawers. If you have a little extra space that you can put in a built in, that’s always the way to go if you can swing it. 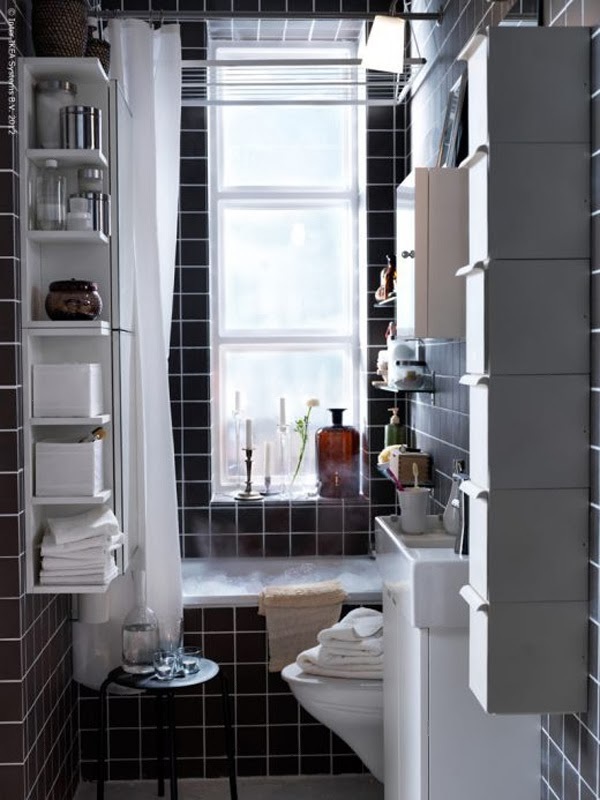 This space looks especially sophisticated because the crisp lines of the toilet really matches the style of the moulding and shelves. I really like all of the artwork in this bathroom. The shelves our great too – just make sure they aren’t deeper than the toilet tank or it could make visits to it a bit uncomfortable! 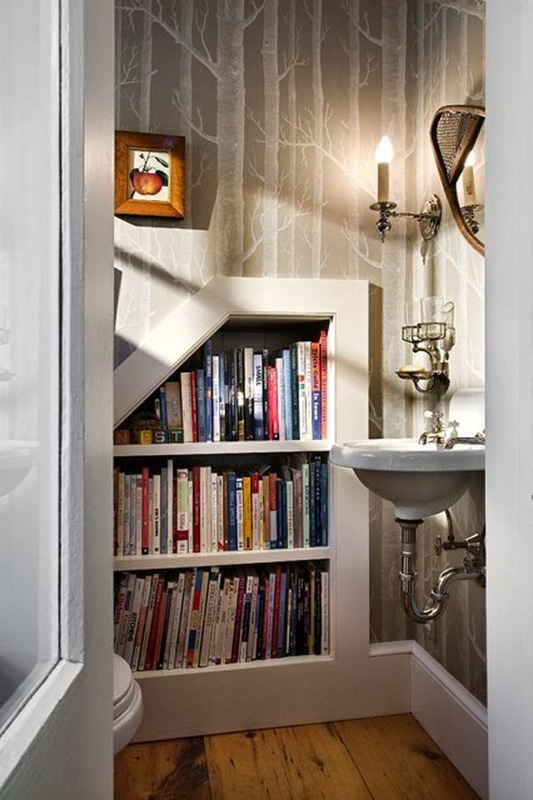 I wouldn’t use the built-in shelves in this bathroom for books – but the bathroom sure looks cute! Making use of the storage you already have may be the best solution! 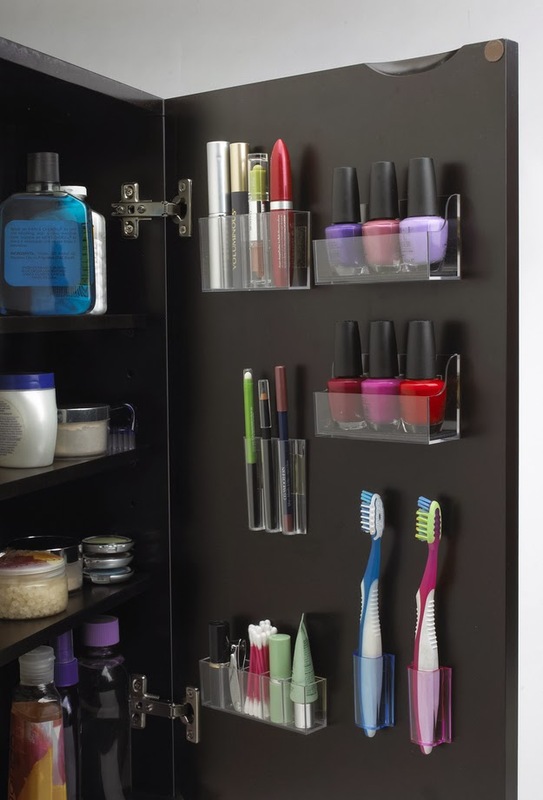 adding a shelf to your door and finding the right storage accessories for your under the sink space can add a ton of storage solutions if you are lacking any extra square footage. There are some great accessories at ltdcommodities for storage needs that could really step up your space. Organizing junkies will love these little stick-on bins…myself included! 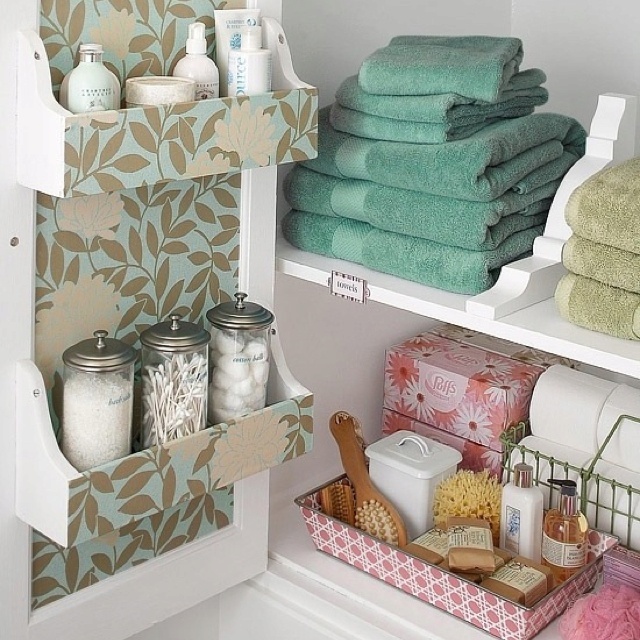 Do you have any tricks up your sleeve for creating storage space in a small bathroom?